Long before the “laglag bala” scheme became a national embarrassment, Philippines was on top of the game. Believe it or not, we are one of the pioneers in aviation and in-flight amenities. Our flag carrier Philippine Airlines, for example, is the oldest in Asia and also the first in the region to fly across the Pacific. But time was such a thief; some of the things that once put the Philippines and its airlines on the map are now but a distant memory. Join me as we relive the glory days of Philippine commercial airlines, their airplanes, and the memorable in-flight features that no longer exist. 1. The “Cloud Nine” cabin. 2. Flight attendants in gorgeous Filipiniana uniforms. 3. Award-winning and innovative in-flight meals. 5. These unique proudly-Filipino airline souvenirs. Most of us hate flying because we can’t sleep even in a semi-sitting position. And that makes us miss the ’80’s when Philippine Airlines offered its passengers REAL beds–a far cry from today’s Equinox 3D seats that look like hospital stretchers. It started when PAL decided to replace its DC-10s with Boeing 747-200Bs in early 1980. The airline deployed the latter–also known as Jumbo Jets–on flights towards North America, Europe, Australia, and the Middle East. It had since become its flagship aircraft. First Class passengers were given a choice of sleeping arrangements: recliners called Siesta Seat for those who prefer to move around in between sleeps; or the innovative “Skybeds” at the upper deck for passengers who want uninterrupted rest. Both were included in the First Class ticket at no extra cost. 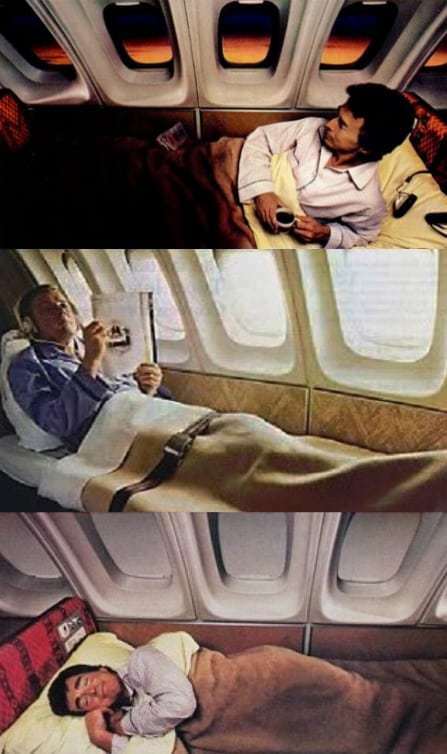 Philippine Airlines’ “Skybed” as it appeared on different print advertisements in the 1980s. To use the Skybeds, a passenger had to climb the staircase leading to “Cloud Nine” upper deck. Once there, you had the choice to sleep in one of the 14 Skybeds–six single-level beds and four bunk beds (with upper and lower levels each). All Skybeds had foam-rubber mattresses, linens, pillows, and a warm woolly blanket. The room is kept dark, but passengers could use reading lights if they wanted. Equipped with a seat belt, each Skybed was certified for both takeoffs and landings which means you could rest in the bed throughout the whole trip–including stopovers. Skybeds lasted until the early ’90’s when cost-effectiveness and fuel efficiency suddenly became a priority. The Jumbo Jets, on the other hand, were replaced by the newer B747-400 which served as Philippine Airlines’ flagship aircraft until its retirement in 2014. If those from international airlines can do it, then why can’t our FAs create their own identity by wearing Philippines’ national dress? Well, if you’re talking about baro’t saya, Philippine Airlines tried it already. Unfortunately, it didn’t sit well with those who wore it. 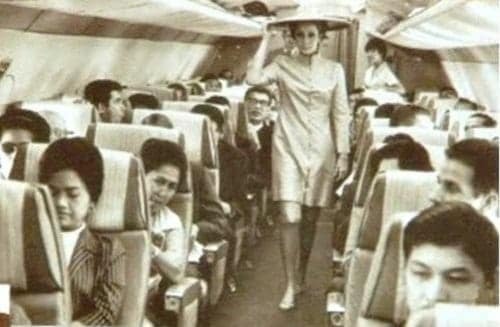 The traditional dress probably affected the flight attendants’ comfort and efficiency that PAL later replaced it with a more modern, Western-style attire. It’s not that Philippine Airlines didn’t try hard enough. In fact, there was a time when PAL had its FAs wear uniforms with a touch of Filipino culture in order to establish our national identity. In 1978, for example, Manila designer Christian Espiritu created T’boli-inspired uniforms which the FAs wore for six years. Other well-known designers commissioned by PAL to dress up its flight attendants were Jose “Pitoy” Moreno (1970), Pierre Cardin Manille (1974), and Italian designer Renato Balestra (1984). PAL is touted as the first Asian airline so it’s a no-brainer that they were also the first to offer airline foods. In the post-war era, PAL’s in-flight meal consisted of basic stuff–as basic as cold sandwiches and coffee kept warm by thermos bottles. And it was all uphill from there. Aside from Continental entrées and Philippine delicacies, our flag carrier also added innovative foods on its world-class menu. At this point, the airline was at its best and set the bar high in making airline foods taste like delectable meals from a five-star restaurant. 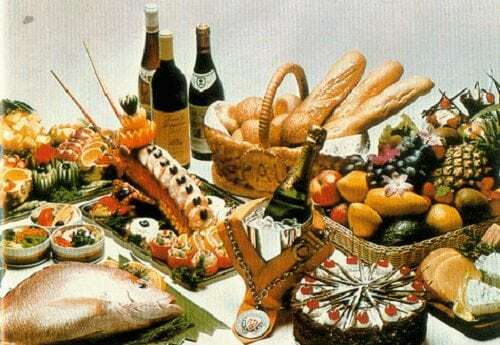 In 1979, for instance, PAL became the first airline in the world to offer France’s “La Nouvelle Cuisine,” which is a healthful way of using fresh ingredients (instead of canned goods) in cooking mouth-watering recipes. The light, flavorful, and exquisite cuisine thrilled the passengers’ taste buds, so much so that it was dubbed “the best in-flight food in the world” by the “Plaisirs Gastronomie,” a prestigious gourmet publication. In the same year, PAL became the first airline to be awarded membership to the gourmet order Les Chaine des Rotisseurs. Today, however, the tide has already turned. Although PAL is still offering “Western, Filipino and Japanese Kaiseki dishes” to its business class passengers, the airline foods have lost that oomph factor. They now can’t hold a handle to world-class and highly-praised in-flight meals offered by the likes of Singapore Air, Qatar Airways, and Turkish Airlines, among others. 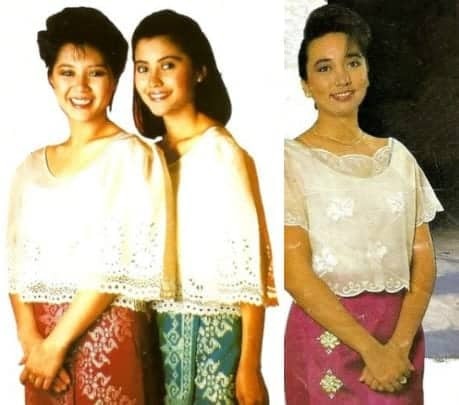 Just when we thought America’s Next Top Model has already tried all outrageous ideas for a fashion show, Filipina models of the 1960’s are ready to prove us wrong. 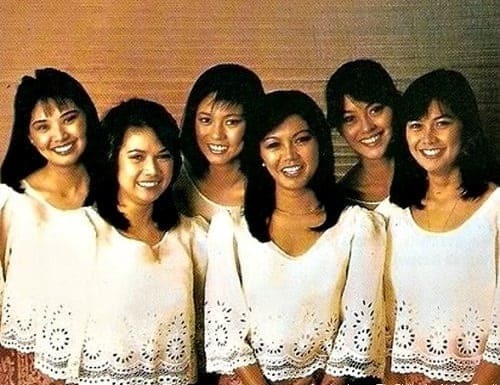 In a showcase of world-class designs that literally took haute couture to new heights, Filipina beauties in the late 1960’s strut their stuff while on board a PAL aircraft. 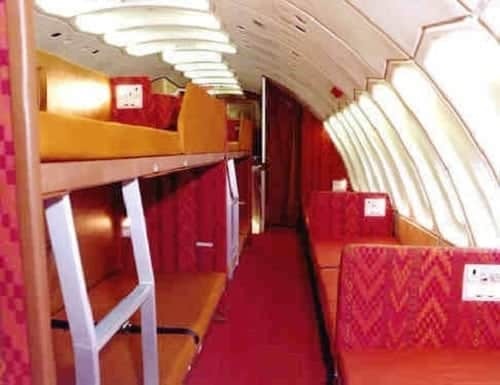 In the above photo, model Pearlie Arcache wore a Pitoy Moreno creation as she modeled her way into the narrow aisle of a PAL BAC 1-11 jet during a domestic flight. Models usually had five to six dress changes at the back section of the plane separated from the passengers’ area by curtains. Marilyn Recio, a 1966 Miss Caltex, was also a favorite model of Pitoy Moreno along with other topnotch Filipino designers of that era–Ben Farrales, Christian Espiritu, and Aureo Alonzo. In one of Farrales’ in-flight fashion shows, Recio showed off the designer’s creation in a PAL jet that would take them to five countries in Southeast Asia. After returning to Manila, they also boarded the USS President Wilson and performed the same fashion show up in the air. Long before airline souvenirs became synonymous to stuffed toys and die-cast airplanes, PAL was creative enough to sell items we could proudly call our own. 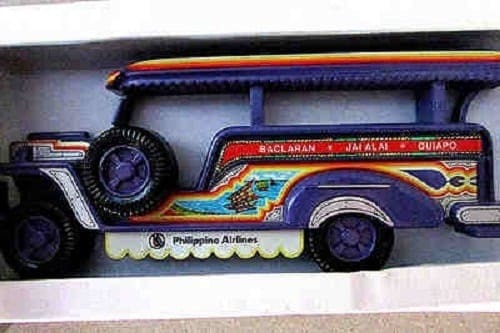 The jeepney toy model above, for instance, promotes a vehicle created out of Filipino ingenuity. This 1980s souvenir for First Class passengers is no longer around, but you can still buy worn-out copies on eBay if you’re lucky enough. Another memorable souvenirs were the playing cards from the 1990’s. Glancing through their unique boxes was like visiting a mini art exhibit. Not only did they showcase incredible works of the finest Filipino painters, they also allowed the passengers to get a glimpse of the things that have defined Filipino culture. Among the artists whose works made their way to PAL’s unique souvenirs were Larry Memije (“Binondo”), a FEATI University graduate whose favorite subjects are ancestral houses due to his background in architecture; Manny Baldemor (“Cartellon”), the famous virtual artist recently featured in a fundraising campaign by UNICEF; and Angelito Antonio (“Saranggola”), whose cubist paintings are reminiscent of the works of National Artist Vicente Manansala. Most of you don’t pay attention to aircraft safety demo–and neither do I. So when Cebu Pacific Air introduced their dancing flight attendants in 2010, people suddenly became interested. The “safety demo dance” was an airline gimmick wherein FAs danced and showed the importance of seat belts and life jackets all at the same time. The YouTube video, showing FAs dancing to the tune of Lady Gaga’s “Just Dance,” took social media by storm, so much so that it has enjoyed 11 million views (and counting). Turns out, the whole thing was just a test demonstration. Shortly after the viral video came out, male FAs did their own version to the tune of Men Without Hats’ “Safety Dance.” A year later, Cebu Pac used the concept once again, this time for a holiday-themed performance on selected flights, with FAs showing their signature moves as Mariah Carey’s “All I Want For Christmas” played in the background. In the end, CebuPac’s safety dance demo never enjoyed full implementation. Dressing Up PAL. (1991). 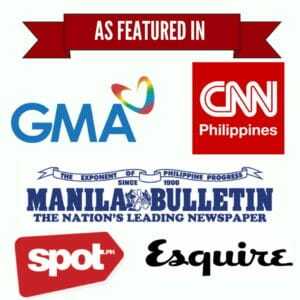 Mabuhay Magazine.